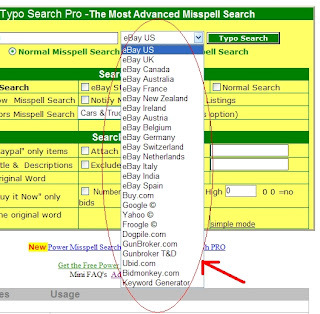 The Misspell Search option will allow you to search the site of your choice for items that are not spelled correctly. 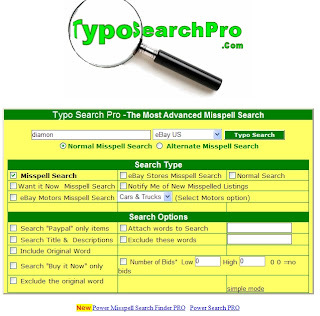 By doing so the search will locate hundreds of items that normal search engines over look. This option is on by default and can only be overridden by the Normal Search option. The correct spelling of diamond should be “diamond” instead of “diamo” probably due to spelling mistakes or limited characters can be typed in the title space provided on eBay title listing so the “n” was missing there. This function currently allows one to search on few auction sites as listed above. The correct spelling of television should be “television” instead of “televison” as normal people will type “television” to search on, so they cannot get these unique search results. As most people can make mistake. 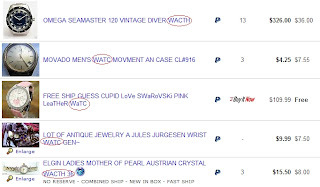 The mistakes here are the keyword spelling mistakes done by some world sellers when listing their item(s) for sales on eBay US. This is most probably due to different countries different styles of English language or spelling mistakes/shortcut keywords being used. In case no one bid on that item(s) you found using this Misspell search function, and the auctions end with low prices, you can get the hunt sometimes. Note: The above sites may update or change anytime. Currently are free to use. So, good luck on your treasure hunt!